I recently had a PS Engineering PMA8000BT audio panel/intercom installed in the A36. It’s a terrific unit with many features. To help me learn the key functions, I created my own Quick Reference Guide to the PMA8000BT. You can download the PDF version from the Pilot Goodies folder at my SkDrive. A recent discussion at the BeechTalk forum led me to dig into a now obscure service once offered at airports that had a Flight Service Station located on the field. Airport Advisory Service (described in AIM 3-5-1. Airport Advisory/Information Services) provides pilots with updates on the local weather and information about known traffic operating on and around an airport. The service isn’t air traffic control; it’s just information for pilots to take into account as they plan to depart or land at an airport that offers AAS. The AFSS team is located in six locations around the country: Prescott, Ariz.; Fort Worth, Texas; Miami; Raleigh, N.C.; Ashburn, Va.; and Princeton, Minn.
A search of the Airport/Facility Directory for the lower 48 states reveals that only 15 airports in the lower 48 currently have AAS, albeit the remote version, provided by one of the FSS hubs or ancillary facilities. The FSS network in Alaska provides AAS at more airports. RAA service is operated within 10 statute miles of specified high activity GA airports where a control tower is not operating. Airports offering this service are listed in the A/FD and the published service hours may be changed by NOTAM D.
The FAA published a notice in the Federal Register in 2006, seeking comments about AAS and its value to pilots. You can read the docket for that notice here. But I can find no evidence that FAA took any general action regarding AAS. However, that 2006 notice lists 20 airports in the lower 48 with the service, so the number has declined in the intervening years. If you’re interested in the history of FSS facilities, see this website. It no longer seems up-to-date, however. Sporty’s Pilot Shop has published an updated ADS-B coverage map. The holes in the ADS-B ground network are filling in. You can read the background information at Sporty’s iPad Pilot News, here. Here’s a short “making of” video from a photo shoot last month in Las Vegas. Jessica Ambats was the photographer. Paul “Sticky” Strickland, formerly a member of the USAF Thunderbirds, was the formation pilot in the Phenom 300 jet. Melissa Courtney flew the Bonanza photo ship; I was the safety pilot in the Bonanza. The owner of the jet (the guy in the blue shirt) invited John Payne, singer for the band “Asia,” to ride along. The flight required considerable coordination with Las Vegas ATC, but they made it work. Requirements for radar monitoring on direct routes, especially for aircraft equipped with an IFR-approved GPS. The changes include new terms—or clarifications of existing terms: impromptu RNAV routes and point-to-point routes. You can read the revised AIM pages 5-1-13, 5-1-15, and 5-3-6 here (PDF). They will be included in the next scheduled update to the AIM. Guidance concerning these changes for air traffic controllers is published in an update, “Global Navigation Satellite System (GNSS) Equipped Aircraft Operating on Random Routes,” to the ATC handbook, JO 7110.639. It’s available here (PDF). The first change concerns equipment codes for domestic flight plans. Fortunately, for typical GA pilots flying with an IFR-approved GPS, the familiar /G suffix remains in effect. You should use the new /V or /S codes only if you have no transponder or a transponder without Mode C.
If you operate in the RVSM airspace and/or use other equipment (such as an INS or a DME/DME FMS) to meet RNAV requirements, FAA has published new equipment suffixes, which are described in the revised pages. Note that these new equipment codes apply only when using the domestic FAA flight plan format. If you use the ICAO flight plan form, use the equipment codes designated for that format. The AIM update changes some considerations for filing and flying off-airway and direct routes if your aircraft is equipped with an IFR-approved GPS. …[A] direct course initiated by ATC or requested by the pilot during flight. Aircraft are cleared from their present position to a NAVAID, waypoint, fix, or airport. An impromptu RNAV route can be approved only in a radar environment, and ATC will monitor the flights on such routes, but navigation remains the responsibility of the pilot. Unpublished RNAV routes are direct routes, based on area navigation capability, between waypoints defined in terms of latitude/longitude coordinates, degree−distance fixes, or offsets from established routes/airways at a specified distance and direction. Radar monitoring is still generally required for such unpublished RNAV routes. But if you have an IFR-approved GPS, and you are cleared to fly a direct route based on published waypoints recalled from the GPS database, radar monitoring is no longer required. Such routes are also called point-to-point routes. The maximum distance between the published waypoints is 500 nm, and the assigned altitude must be at or above the highest minimum instrument altitude (MIA) along the route, which provides obstacle clearance 4 miles either side of the route centerline. 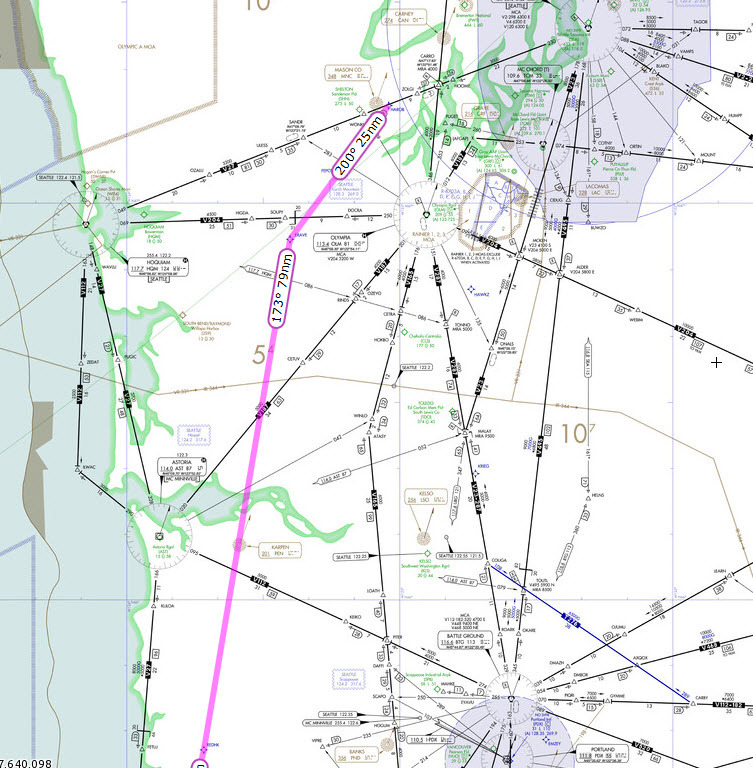 For example, a point-to-point route from an airport in the Seattle area to Newport, OR (KONP) might use named RNAV fixes en route and end at a VOR: HAROB FEBOT ERAVE REDHK ONP. If you’re flying a GPS-equipped aircraft, radar monitoring wouldn’t be required along that route.